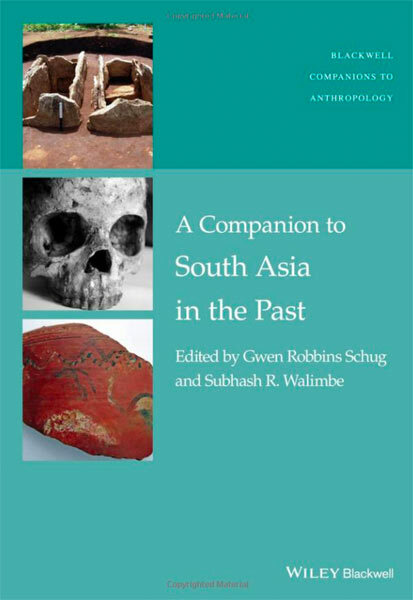 A Companion to South Asia in the Past, edited by Gwen Robbins Schug and Subhash Walimbe, over 500 pages of great insight and new data, reveals the quiet and powerful role of bioarchaeology in Indus studies. Bioarchaeology is defined by one of its first practitioners as "the reconstructions of past people's lives based on a multidisciplinary analysis of archaeological human remains. Bioarchaeology is one of the few fields of inquiry that emphasizes integration of three subdiscipines of anthropology: biological anthropology, archaeology, and sociocultural anthropology." Published in the summer of 2016, this excellent book is the latest cross-discipline research in studies of the Indus civilization. Some 33 largely excellent essays, by established and young Indus scholars, yields a surplus of information relevant to all sorts of controversies and themes in the field. "The most recent comprehensive analysis of this type used cranial measurements and non-metric traits of the skull and teeth to measure biological affinities within and outside the Indus Valley (Hemphill et al., 1991)," writes Lovell, and "results from this analysis provide at least initial answers to some of the basic questions pertaining to the nature of population relationships in the Indus Valley. According to Hemphill and colleagues, the Harappan people who were buried in the urban phase cemetery most closely resemble other people from the north-western sector of the Indian subcontinent. This resemblance supports the proposition that gene flow occurred along trade routes between Mesopotamia and the Indus Valley, resulting in a phenotypic variability along an east-west axis (Hemphill et al., 1991; Kennedy, 2000). The study also shows that people from cemetery R-37 at Harappa have the closest affinity with the people buried in Stratum II of Cemetery H; thus there is no evidence of marked biological discontinuity in occupants of the city through time. However, individuals in the small skeletal sample from Mohenjo-daro, which were found in disarray in several localities of the site, exhibit a unique and diverse pattern of morphometric characteristics that sets them apart from other populations of the urban phase of the Indus civilisation." (p. 171). The book is dedicated to K.A.R. Kennedy of Cornell University, a mentor to many of the authors published, and author of the remarkable God-Apes and Fossil Men, a revelatory memoir of investigating human and allied species in the subcontinent since the earliest times hundreds of thousands if not millions of years ago. Many of the authors are in India and Pakistan, at local universities which are now taking up the study of remains in there areas that stretch back long before the Indus civilization flourished, allowing a more complete picture of events and changes. There are also excellent discussions of areas often left out of any research, like the Prehistoric Archaeology of bangladesh and Nepal, the Peopling of Sri Lanka, the role of museums in Indian anthropology and a final essay titled Where Are They Now? The Human Skeletal Remains from India. Bringing together so many experts across such wide disciplines, yet pulling it all together in an expansive and rich Introduction, Gwen Robbins Schug and Subhash R. Walimbe have given a great sense of how multi-dimensional and full of new kinds of facts ancient Indus research is becoming.